Watching musicians perform without a net can be thrilling. Too often concerts we see feature presentations that have been rehearsed to the point that they have essentially become theater pieces billed as music concerts. Rote performances, no spontaneity, no surprises. To be sure, those kind of performances can be fulfilling and satisfying. 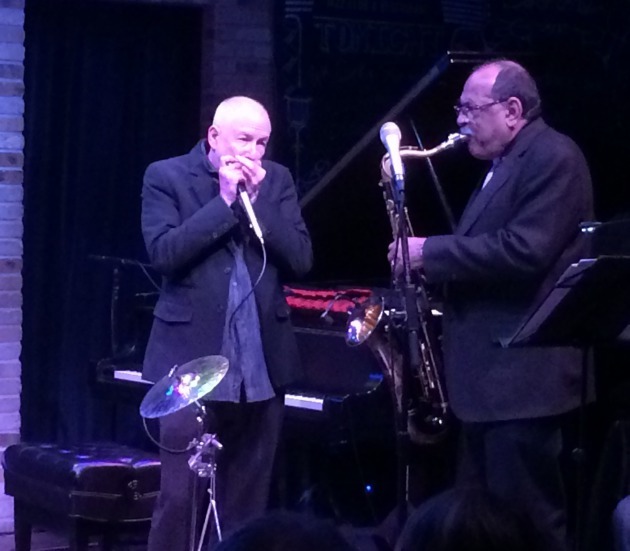 But it’s exciting to watch musicians create on the spot, as was the case with Corky Siegel’s Chamber Blues with guest saxophonist Ernie Watts on Sunday at the Dakota Jazz Club. “Jazz,” interjected Patricia Watts, Ernie’s wife, who was sitting near the stage. Except this was Chamber Blues – Siegel’s mix of blues with a classical string quartet – with Watts thrown into the mix for the first time. He rehearsed with Chamber Blues once via Skype and then for three hours on Sunday afternoon. At night, it was live with sheet music and without a net. Watts, 70, perhaps most widely known for touring with the Rolling Stones in 1981, has played with countless pop, rock and R&B stars (Frank Zappa, Carole King, Marvin Gaye), numerous jazz stalwarts (Thelonious Monk, Charlie Haden, Pat Metheny) and “The Tonight Show” band for 20 years (during the Johnny Carson era). He’s also led his own quartet and recorded more than a dozen albums under his own name as well as playing on more than 500 records. Watts brought several of his own tunes, including the serene ballad “A Simple Truth,” the Middle Eastern-tinged “Oasis” and the gorgeous “Spirit Song” (featuring his work on a Native American flute), to the program. But most of the repertoire during the two 75-minute sets came from either the Chamber Blues catalog or Siegel’s tenure in the late 1960s and early ‘70s with the Siegel-Schwall Band, a blues group from Chicago. The compositions and the improvisations had a sense of dynamics, tension and rhythm, elements that blues and classical have in common. There was a playfulness to Siegel’s patter and his playing, especially the way he interacted with the other musicians. Even though there was sheet music, much of Watts’ playing seemed improvised, especially his exchanges with Siegel’s harmonica and piano. To watch two musicians listen to each other play and respond with such passion and expressiveness was a treat. The string section clearly knew how to groove, and when things got cooking with them, Watts and Siegel, percussionist Frank Donaldson’s face lit it as he sat on the floor with these magical sounds swirling around him. He was enjoying it as much as the fans, who offered more than one standing ovation during the long but unforgettable evening. There were chances for the various players to shine, including violinist Chihsuan Yang on a two-string Chinese instrument known as the erhu and Dave Moss on viola. Siegel had impressive turns on harmonica and piano but his personality and humor made just as lasting of an impression. With his serviceable voice, he sang “Angel Food Cake,” the Siegel-Schwall blues ode to the drug daze of the ‘60s. And he had a lot of fun on the finale of “Idaho Potato Man,” with him on piano and Watts on saxophone. The piece ended with, one by one, each of the Chamber Blues players adding their hands on the keyboard, eventually producing seven hands playing piano. Indeed, a grand time was had by all.